Bring sugar, water and peaches to a boil in a small saucepan. Then lower heat and use a wooden spoon to stir and crush the peaches to infuse the flavor. In the meantime, brew your tea using either a large pot or a tea maker. NOTE: Use less tea if you prefer it weaker, or more tea if you prefer it stronger, and try not to let it steep longer than 4-5 minutes or it can get bitter. Once brewed, remove tea bags and transfer to a pitcher. Refrigerate to cool. To serve, either set out simple syrup and add as much to the tea as you like, or add all of the simple syrup to the tea and stir. I prefer leaving it separate. 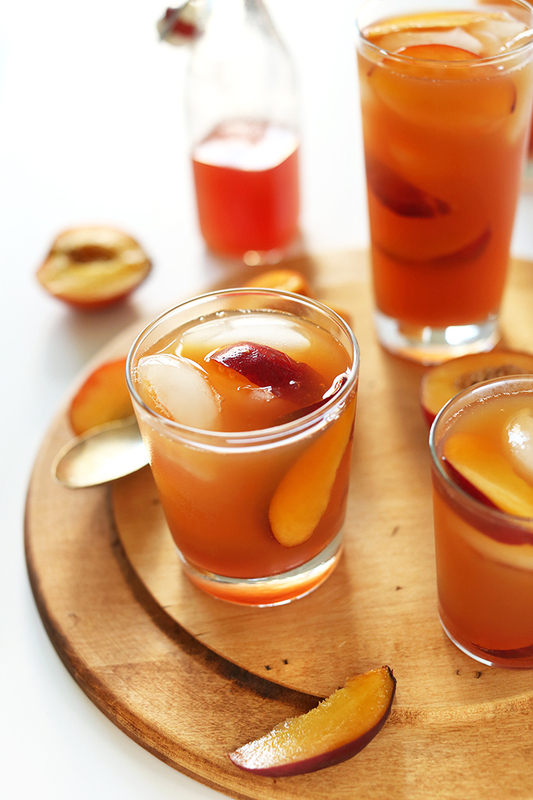 Serve tea over ice and fresh sliced peaches. Yields about 10 servings (with ice and peaches).